I request all the engineering students to take a closer look at the man in the picture. He will inspire you to clear your exams with ease. Clearing all papers to get an Engineering degree is not an easy joke these days. I have been there; felt pain during my exams, beaten to pulp by Engineering mathematics; but eventually rose like a phoenix bird to finally clear my papers to get my Engineering degree. But there is one paper that can give you piles because of the number of attempts one takes to clear the paper. It is the mighty DSP (Digital Signal Processing). It is also called as "Degree Stopping Paper". It has single handedly blocked many engineering students from sitting for campus interviews. "Honey! This is how I cleared my DSP paper. I never knew a single thing in that paper. But still I remember standing up and asking for 12 additional sheets of paper to fill the sheets with my answers. For one ten mark question, I even answered with a film review about the movie Sethu. Three extra sheets were used for that question". She gave me a dirty stare. Good that I did not reveal her the marks I got for that paper. 87 out of 100. Check this video to see Arjun Sampath's debating skills and understand how he handles all questions with ease. 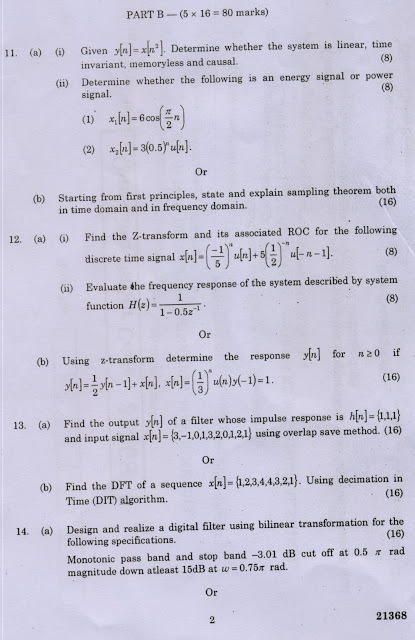 I just got hold of a DSP question paper. One sand also I did not understand. Do you understand anything from the picture below? Even if you know the answer, please keep quiet. Do not put vetti scene. Just remember that I have got 87 marks out of 100 for the same paper. So please show some respect. No one has yet understood the Duckworth Lewis method. Similarly no one will ever understand Arjun Sampath's method of answering a question. I would love to see Arjun Sampath being interviewed by Arnab Gowsami. TRP egiridum.